Details on how to enter to win a copy of the first of many Halloween mysteries we will be featuring this month at the end of this review. Also, a link you can use to purchase the book where a portion goes to help support KRL. Ten years ago Maralee Kowalski left her home of Salem, Massachusetts with the dream of becoming a star. After losing jobs as a weather girl and home-shopping network host, she is returning from Florida as the newly-named, thirty-three year-old widow Lee Barrett, to live with her Aunt Ibby and to apply for a position as a real television news reporter. While the position is already filled, the psychic host of Nightshades has just walked off the show; permanently, as Lee learns firsthand. Lee may not be a believer, but she has acting experience the program director is looking for in a replacement. Before she knows it, Lee has her foot in the door of WICH-TV and another new name, Crystal Moon. Lee’s surprised to discover the late Ariel Constellation provided more unlicensed counseling than actual visions, although some of her calls turned out to be eerily prophetic. As Lee studies Ariel’s books on tarot reading and numerology, Lee has the stunning revelation of seeing a vision of another murder within Ariel’s ebony crystal ball. Even more shocking, is Aunt Ibby’s reluctant confession that, as a child, Lee used to make strange prediction—at least until her parents’ fatal car crash silenced both her voice and her visions. Her speach returned, but the Sight did not. Until now. Lee finds herself in the awkward position of having information she cannot share without implicating herself, as the police already are suspicious of her easy transition into Ariel’s job. Watching new reporter Scott Palmer conduct on-the-street interviews is a conflict, as Lee knows she could do better. As the Witches Ball and Halloween approach, Lee will have to balance her duties at the station with an investigation into who decided to continue Salem’s dubious legacy. 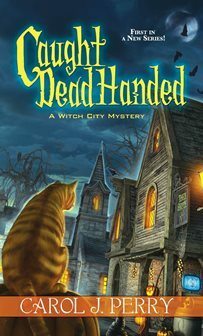 In this nearly four-hundred page novel of the debuting A Witch City Mystery series, the author takes the time to fully develop her characters without wandering from the plot or slowing the pace. The fun comes in the exploration of residents of Salem and the employees of WICH-TV, who include the low-key Scott, detestable owner Mr. Doan, and the siblings who work behind the camera. Part-time librarian Ibby is a standout as she is immersed in social media, tech savvy, and organizes her home library in the Dewey Decimal system. The paranormal element is low-key as both Lee and the reader learn more about her skills and the tradition so associated with Salem. Behind-the-scenes glimpses into a working news station and the realistic investigation of her co-workers contrast with phone-a-psychic calls and Ariel’s supportive wiccans. The practical and aspiring journalist Lee is a heroine sympathetic and strong enough to carry this new entry in the growing cozy paranormal genre. The author takes the time to craft realistic supportive characters. Readers will find themselves immersed a charming novel full of subtle humor, witty dialogue, and a skillful blend of practical detecting and the paranormal. To enter to win a copy of Caught Dead-Handed, simply email KRL at krlcontests@gmail[dot]com by replacing the [dot] with a period, and with the subject line “Caught,” or comment on this article. A winner will be chosen October 11, 2014. U.S. residents only. Thanks for the review Cynthia. I so much appreciate a good long positive review with no spoilers! Hope you’ll read the next one–Tails, You Lose–out in Spring 2015. Normally I don’t witch book but this one sounds good, thanks for chance to win a copy!